Martini, Frederic H.; Nath, Judi L.; Bartholomew, Edwin F.
Pearson. LOOSE LEAF. 0134452313 Item in good condition. Textbooks may not include supplemental items i.e. CDs, access codes etc... . Good. Pearson, 2017-01-20. Softcover. New. ***International Edition***Soft cover/Paperback*** Textbook printed in English. ***Brand New***. Most international edition has different ISBN and Cover design. Some book may show sales disclaimer such as "Not for Sale or Restricted in US" on the cover page but it is absolutely legal to use. Please provides valid phone number with your order for easy delivery. by Frederic H. Martini (Author), et al. Pearson. LOOSE LEAF. 0134452313 US Edition Textbook, May Have Highlights, Notes and/or Underlining, BOOK ONLY-NO ACCESS CODE, NO CD, Ships with Emailed Tracking from USA . Good. Pearson. LOOSE LEAF. 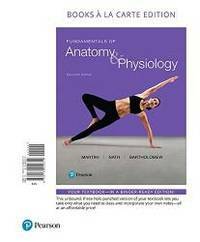 0134452313 New Textbook, Ships with Emailed Tracking from USA . New.